“Main kya khaas bataunga aapko (what insights can I give you? ),” a 24-year-old Umesh Yadav had wondered five years ago when the writer had approached him for an interview. It was a sunny afternoon in Rajkot. Umesh representing India ‘B’ in the Challenger Trophy had packed up post the practice session. With his headphones on, he sat under the concrete shade of a part of the Saurashtra Cricket Association Stadium, which was still on the brink of refurbishment back then. Bowlers who could clock top speeds were still a rarity. But Umesh’s pace had excited the Indian cricket circles in his first couple of years at the international level. Seen as the impact bowler India had longed, one approached him for a chat on how he planned to harness his talent and become the country’s premier tearaway quick. Umesh was polite and did not exhibit the air of a cricketer who has represented India. With a smile on his face, he spoke about the music he was listening to and the heat that Rajkot was baked in. But for all his promise on the field, Umesh did not have much to contribute off it - in terms of his thoughts. More than it being a dampener, it was a surprise. Not all fast bowlers are known to be the most astute of thinkers about the game, but the successful ones at least think about their personal game. In the brief chat back then, there were hints that Umesh was yet to develop that aspect – to be able to strategise and plan for himself. Over the next couple of years, this inadequacy exposed Umesh on the field. It often felt as if all he did was run in and deliver the ball. No, that is what he was picked to do. But he appeared to do it without any thought behind it. He would steam in and release a barrage of thunderbolts, but most of them were harmless because they lacked a plan. Eventually, he would not set the batsmen up. He would allow the batsmen to settle down. Umesh had been expected to be the leader of India’s pace attack with time. Instead, he was engaged in a battle to seal a permanent spot in the Indian team. The struggle, however, made Umesh wiser. He would return to the domestic circuit and sharpen his mind. Fortunately for India, the Umesh of the last couple of years was a transformed bowler. He did not turn up as the leader of the pack suddenly, but his pace and swing was complemented by an evident plan. It wasn’t about running in and rolling the arm over alone anymore. It was about doing it in a way that makes the batsmen uncomfortable. When Umesh stood out as one of the top pacers in the Indian Premier League earlier this year, there was brightened hope that he could raise his game in the season that followed. The Champions Trophy in England offered Umesh the perfect platform to continue his climb. The English conditions are a seamer’s delight. He was even chosen ahead of Mohammad Shami, who was returning from injury, on the back of his impressive IPL form. The stage was set for Umesh to rule on. Unfortunately, he slipped. After he was the bowler the Sri Lankans feasted upon the most in their unexpected triumph over India, Umesh was resigned to the bench. 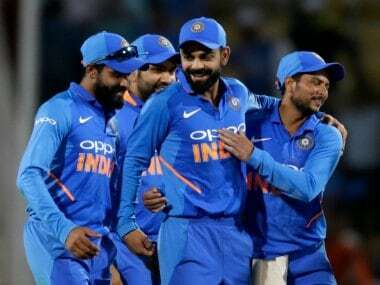 Captain Virat Kohli decided that the pace of Bhuvneshwar Kumar, Jasprit Bumrah and Hardik Pandya was enough. He preferred the off-spin of Ravichdandran Aswhin over the floundering Umesh for the must-win against South Africa, the semifinal versus Bangladesh and the summit clash with Pakistan. 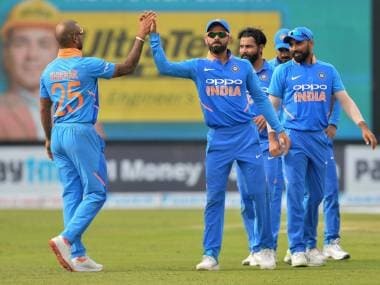 Had it not been for the Board of Control for Cricket in India’s decision to rest Jasprit Bumrah for the tour of the Caribbean, Umesh’s hours on the bench would have piled up. But the one-dayers against the West Indies presented Umesh with a quick shot at redemption. And, the captain offered him that shot immediately by playing him ahead of Shami once again. Rain in Port of Spain during the first ODI robbed Umesh of his first opportunity to regain lost glory. But on Sunday, the sun broke through to allow a 43-over game. 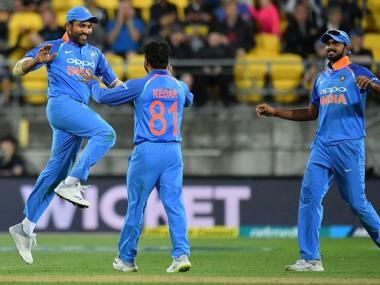 Against a West Indian outfit defined by inexperience and youth, Umesh could have used the second ODI to remind Kohli of his prowess with the ball. It was a game India was expected to win, and they did. 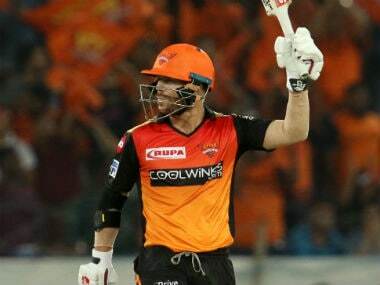 But in a match where every bowler chipped in by either sending the batsmen back to the hut or by restricting the runs, Umesh stood out for being unable to do either. The first two overs felt as if it was the thinking Umesh of last year, who excelled through the home summer of cricket. He stuck to the team’s plan of bowling outside off-stump and inviting the batsmen to chase the deliveries. When Umesh’s away movement beat Shai Hope’s outside edge at the start of his second over, the pacer smiled at the batsman. It is a smile that Umesh tends to throw at the man with the willow when he believes he is in control. But the control did not last for too long. Umesh’s hold over it slipped in the next over as he offered Hope a ball on the pads – against the team’s plan to pepper the corridor outside off-stump. The West Indian clipped it away to the boundary to land the first blow on Yadav’s hold over the control he seemed to have been the master of thus far. Suddenly, the confidence had been shaken. Umesh now lost the length and lost the plot. On a flat track, he decided to go short. In an innings where the West Indian batsmen had struggled to find the fence, Umesh’s shorter length served them opportunities to change it on a platter. By the time India had brushed aside Jason Holder & Co, Umesh had ended up as the bowler who did not think from a few years ago. He had bungled another opportunity to return as one of India’s preferred fast bowlers. Among the pacers on Sunday, Bhuvneshwar was phenomenal, as he has been recently. He allowed the West Indians only nine runs in his five overs and scalped two of their batsmen. Even the all-rounder Hardik Pandya maintained a miserly economy rate of 3.55. On the other hand, Umesh ran in for six overs. He leaked 36 runs and failed to inflict any damage on the hosts. Three more ODIs and a T20I remain. It is likely that Umesh will play most of them. But his off-colour display in the second ODI, after he had lost his place in the Champions Trophy, must concern him. For, Bumrah will eventually return for the next series. Bhuvneshwar has been the most developed of the Indian pacers. Shami, who is three years younger to Umesh, is renowned for his consistency. In the seven years since his first international outing, Umesh is yet to cross the 100-wicket mark in any format. It is a mediocre record for a bowler who aspired to be the leader of his country’s attack. However, he seemed to have turned a corner over the last year before he slipped into this hole of indifferent form. The third ODI at North Sound on Friday will bring along another opportunity for Umesh to shake off the rust and frighten the West Indian batsmen. Like he should have at Port of Spain. Like the team expects him to. The team will hope it is the start of a glittering spell of international cricket for the speedster. The pacer will hope it is the start of his most productive spell, one after which he will have boundless insights to fill the world with.